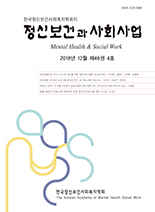 정익중, 이지언,(2011).청소년기 비만과 외모만족도가 자아존중감에 미치는 영향 .정신보건과 사회사업,38(),60-80. 세계적으로 청소년기 비만의 유병률이 가파른 수준으로 상승하고 있으며 우리나라도 그 예외는 아니다. 청소년기 비만은 발달단계 고유의 심리사회적 특성으로 인해 성인기 비만의 신체적 문제와는 다른 관점으로 접근해 볼 필요가 있다. 본 연구는 청소년기 비만과 외모만족도가 자아존중감에 미치는 영향을 살펴보는 가운데 성별이 조절효과를 보이고 있는지 확인하고자 하였다. 왜냐하면 성별에 따라서 자아존중감에 미치는 영향이 상이하다면 시기적으로 예민한 청소년기 학생의 정신건강 정책에 대한 성별에 따른 차별성이 요구되기 때문이다. 본 연구는 전국규모의 횡단조사 자료인 한국청소년정책연구원의 2009년 아동청소년 비만실태조사 자료를 사용하였다. 분석결과, 성별에 따라 비만이 자아존중감에 미치는 영향은 상이한 것으로 나타났다. 비만은 남녀 모두 자아존중감과 부적(-) 관계를 나타냈으나 여자청소년의 경우 비만도가 높을수록 자아존중감은 급격하게 저하되는 반면 남자청소년은 비만도가 높아도 자아존중감은 완만하게 저하되는 것으로 나타났다. 외모만족도는 남녀 모두 자아존중감과 정적(+) 관계를 보였으나 그 영향은 여자청소년에게 더 큰 것으로 나타나 성별에 따라 미치는 영향은 약간 상이하였다. 청소년기 비만과 외모만족도가 자아존중감에 미치는 영향이 성별에 따라 상이한 결과에 근거하여 청소년 정신보건사회복지의 실천적, 정책적 함의를 살펴보았다. Recently, the prevalence of obesity is rapidly increasing among youth in Korea. The adolescents` obesity leads to a higher prevalence of obesity in adulthood, which increases psychosocial and mental health problems as well as physical health problems. The purpose of this study is to examine the moderating effects of gender on the relationships among obesity, satisfaction with appearance and self-esteem in adolescence. This study used data from the Korean Youth Obesity Survey 2009 administered by National Youth Policy Institute (NYPI) and conducted multiple regressions. Results showed that there were significant moderating effects of gender in the relationships among BMI (body mass index), satisfaction with appearance and self-esteem. For both boys and girls, there was negative relationship between BMI and self-esteem. The girls` self-esteem was significantly lower than that of boys when BMI was increased. And the boys` and girls` self-esteem was increased in proportion to satisfaction with appearance. However, the girls` slope was slightly higher than that of the boys. These results indicated that a counseling program for obese girls should be arranged in school. Also, it is important to educate the girls on how to obtain adequate body image. Further implications of this study for youth welfare were discussed to reduce risk for psychosocial problems following adolescent obesity.